She came from the Lowveld, Zimbabwe, in a cardboard shoe box. She was about six weeks old, all wrapped up in loose skin. Her long ears dragged and she'd often trip over them. Her eyebrows threatened to close her eyes at times. Even her lips disobeyed when she ran, doing their own thing. So she was named "Flapjies", or "Floppy", in English. She was a soft, shiny brown all over: a little Short-haired German Pointer. Flop's training started straight away. While she ate, Martin would slam the door to accustom her to loud noises and eventually train her not to be gun-shy. He'd shoot a dove and then tie it to a length of fishing line and drag it around the garden, leaving a scent trail for her. He taught her in this way to track and to retrieve - and NOT to eat the bird! Flop had such a soft heart, and a healthy conscience. She also had a long memory. If she'd done something wrong, she'd pull her long lips back in a ridiculous grin and look up at him from under her "eyebrows", as if to say, "I won't tell anyone, if you don't!" Flop had many many hours of training, lying on Martin's hunting jacket while he deliberately disappeared into the veld for hours till he returned to find her still guarding his jacket. Of course, she didn't always obey. Following him was far more exciting, but she soon learnt that to obey is better than sacrifice! Flop also bore the brunt of Martin's learning years. He'd gleaned his knowledge of dog training here and there and had his own ways to add to it. He made mistakes and was often too hard on her. Somehow, it bonded her to him in an incredible, unbreakable way. After a while, she'd follow him like a shadow, lie at his feet and silently watch his every move. Often she'd anticipate and be wrong, but if he clicked his fingers in a certain way, or made a certain sound, she'd be on her feet in a second, or be back at his side if she'd been off on a scent trail. When I first met Martin, Flop was three years old and already a well-trained bird dog and an excellent companion. I'd often walk quietly behind Martin through the bush as we stalked some francolin, and watch fascinated as Flop would follow, carefully laying her paws down, avoiding dry, brittle leaves and sticks - anything that would make a noise and give away our position. She didn't move her head a lot, but her eyes flickered from the trail to Martin to the direction we were going in constantly. Her whole body quivered with excitement. How she loved the bush! It was her life. 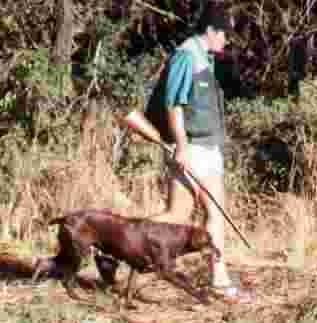 Floppy & Martin hunting in Zimbabwe. After Martin and I got married, we'd get on the old motorbike and ride slowly around on the 380,000 acre ranch we lived on in Zimbabwe. Flop and Patch would trot along beside us, tongues lolling and eyes in a bored, exhausted attitude. The minute we turned off the dirt road and onto a little game trail, they'd both become suddenly alert and alive, sniffing at bushes and jumping into tufts of grass. Flop's whole life was like that. Inside the security fence around our home, Flop was a normal dog, lying in the sun, strolling around, doing nothing in particular. She wouldn't trouble herself to bark at anything, unless it was really something of concern. But as soon as the gates were opened, she came alive. She was a different dog. She shed the lethargy and listless look and looked sleek and disciplined and ever so serious. And she was good. Never once did she point at nothing. Every time something would fly out or we'd search and uncover a nest of chicks or something. Once Martin and I searched so long and hard, we thought she was wrong. Just this once. But she wasn't. We eventually saw three extremely camouflaged chicks in a nest right in the heart of a clump of grass. She wasn't only good at bird hunting. She tracked, cornered and held at bay any animals Martin or his friends had shot and wounded. If it weren't for Flop, we would have spent hours and hours searching for wounded animals and birds. We'd been out looking for a warthog to shoot. We spotted one running through the long grass, its long tail sticking up in the air as a beacon for us to follow. Martin left the vehicle where it was and stalked as close as he could. But not close enough. He chanced a shot and hit it in the lower leg with his .22. It wasn't badly wounded and would have made it, albeit in much pain for a while. But the minute the rifle shot rang out, Flop leaped out of the grass and gave chase. She chased the warthog for hours. We lost her and the hog and went back to the vehicle to wait for her to return. She did not. Eventually we heard a yelping in the distance and followed the sound. She'd backed the warthog into some thick thorn scrub and was barking at it, keeping it there until we could come and finish it off. How long she'd waited for us! She was hoarse and her mouth was so dry. But she stayed and when she caught sight of us in the corner of her eye, her excitement and strength returned and she gave it all she had. Flop was not ordinarily a brave dog. She never jumped on people, or licked them. She minded her own business and got out of children's way. She loved peace and quiet and hated confrontation. I knew she'd never be a dangerous dog, and I liked that for our children's sake. But if Martin was around and she felt he was threatened in any way, the hair on her back slowly would rise and a low rumble would start in her throat. If the person or thing came closer, she'd fly at them, barking and snapping in an alarming way. I think, for Martin, she would have fought to the death. But not for anyone else. I tried to befriend Flop, and she accepted my efforts condescendingly. She was not a two or three-man dog. She was a ONE-man dog. She'd accept the bones and raw meat I'd give her and allow herself to be coaxed into sitting or lying down. But so far and no further. If I took her for a walk on my own, I could swear she was stone deaf. She'd trot off into the bush and I wouldn't see her for hours. All my calling and whistling and shouting didn't even raise a flick of an ear. But if Martin was with us, all he had to do was click his fingers (if she was close enough) or whistle, and it was like he'd pressed a button on a remote control. Back she'd come. I think this is because her memory was the longest memory I think a dog has ever had. In her early years, she got many hidings for disobedience and she never forgot them. As she got older, Martin was more gentle with his reprimands. In fact, she'd get a guilty conscience while walking with me, because she KNEW she wasn't allowed to stray more than 100 meters from me, and when she did, and disappeared for a few hours, she'd slink home and hide in the grass by the gate, waiting for Martin to come home. She would NOT come home before he did. Not for food, not for scoldings, not for a hiding, not for anything. She stayed put. And when she heard the sound of the motorbike rumbling down the dirt road, she'd lay her head on the ground, so as to be totally hidden. He'd drive in and she'd sneak in behind him and hide behind the garage wall, waiting for the inevitable scolding she'd get when he found out. We had a lot of baboons around our house, eating the cattle feed. Martin often used to shoot them. But he always locked the dogs up in the security fence because baboons can be treacherous and can kill a dog without much effort. One day he shot a big baboon and went out to try to shoot more. Somehow the dogs got out and Flop chased one up a tree. It was a big male baboon. Although Martin shouted at her to "Heel! ", she ignored him, too excited to obey. The baboon raced down the tree and jumped on her back, sinking its fangs into her. She fought and bit for all she was worth and hung on, shaking the baboon like a rat. A baboon's skin is very loose, so that it can actually turn around INSIDE it. That's what it did. It got a hold on her throat, severing her jugular vein. Martin tried desperately to shoot the baboon, but the fight was too fierce and he was afraid of shooting his dog. He eventually got a shot in and pulled Flop off the baboon. Blood was pumping out of her jugular and she was covered in bite marks. She had a huge tear from the back of one ear to the back of the other, right across her head. She was happy though, standing and panting and smiling at her victory. I got a frantic call to bring ice. When I found them, Martin was pinching the jugular closed, blood pouring all over his hands. The closest vet was an hour's drive from us, along terrible roads. We were told not to bother, that she'd be dead long before we arrived. We went anyway. Flop made it to the vet. She was put on 2 drips, given 74 stitches and kept in for three weeks. It was close, she nearly didn't make it. She looked so pitiful! She whined and hardly ate. But when we brought her back home and she smelled the bush, her appetite picked up and she was alive again. She had many close calls, but the closest one was with a wounded wildebeest. It had a broken leg and Martin gave a friend the opportunity to shoot it. He fired and missed. Flop immediately gave chase, and was lured in by the animal. It was on its knees, waiting for her to get close enough. She took the bait. It hooked her in the chest with one horn, and in the inside thigh with the other. It ripped her chest open and threw her on the ground, nearly taking her one back leg off. Martin ran up, shot the wildebeest before it could trample her and once again, we rushed her the hour long journey to the vet. This time she was there for a month. She came back very fragile, but it wasn't long before she regained her zest for life. We entered into a shooting and bird-dog competition in 1999. Flop and Martin won the trophies. She outshone all those dogs. She was quick to obey and always at Martin's side. She pointed more birds than the other dogs and never took off, yelping at rabbits. Although she didn't retrieve, because she was taught not to when Martin was initially doing falconry, she always found the fallen birds for Martin to retrieve. Flop lived to be in the bush. If Martin had been busy and we didn't take our usual evening stroll, she'd lie at the gate and whine mournfully. When we moved from the ranch three years ago, to a smaller farm where evening strolls were dangerous, due to the political situation in the country. If we went out, we'd meet up with war veterans. So Flop spent much of the last three years of her life cooped up in a smallish garden behind a security fence. How she hated it! Every evening, about the time we'd usually go for a walk, she'd sit at the gate and howl and howl. No one could shut her up. She aged very quickly then, too. Suddenly her muzzle grew white and her dark, shiny hide a light, insipid mustardy brown. She got fat and lazy and bored and sad. Poor Flop. Martin was working so hard, he only took her out a few times. Then we moved to South Africa in October 2002. Trying to settle in and adjust to new surroundings and a demanding job, Flop was left to mourn and watch and wait. Unfortunately Time waits for no man. Someone opened the door onto her back as she was lying against it. After that she cried and whined pitifully at night. The vet said it was bruising and dosed her accordingly. He even cut her nails for the first time in her life! the pain only grew worse and on examination, a different vet said she had a massive growth the size of a large grapefruit inside her stomach. She had to be put down. Martin was away at the time, but I think Flop knew something dreadful was going to happen because she came up to me and looked right in my face and gave a little whine. I am not a "doggy" person. I've grown up loving cats and despising dogs. But I loved Flop. And my heart broke to have to put her in the back of our pick-up truck - not to go hunting, this time - but to put her down. It seemed such a treacherous thing to do to such a devoted friend. We buried her on the farm beneath a thorn tree near a river where the guinea fowl live. My three children and I sprinkled bird seed and bread crumbs over her grave so that the birds would come and sing to her. She's in the Happy Hunting Grounds now, where there are no fences, no "main roads", just glorious, endless bush and countryside and francolins to spare! "Where do dogs go when they die? Is there really a happy hunting ground?" Is Floppy running free now? My personal belief is that dogs go to heaven. God created all life. When his creatures have served their time on earth, they will return to God's spiritual realm. They won't need to hunt - they will be content to be with their heavenly Master. I believe dogs will go to heaven automatically - they will have no say in the matter. The only creature that has a say in it, is man. Man has been given freedom of choice. People who choose to get to know their Heavenly Father by reading the Bible daily, praying and spending time with other believers, will find that "narrow gate" which the Bible talks of, and will enter their Father's house. Those people who shut God out of their lives, will still meet God when they die, but He will say to them, "Get lost! I never knew you! Your dog can come in, but you can't." Those people will endure unending torment and regret. In Jesus' day, people were not as sentimental over pets as we are today. Whether or not dogs got into heaven was not an issue, so he gave no guidance on this subject. What people did ask Jesus was, "What can I do to get into heaven?" This is the question we should be asking! Do animals have any sense of God? Perhaps they have more sense than we have! The way animals have the knowledge to flee from earthquakes, storms, forest fires, & tidal waves is uncanny. They seem to know that danger is coming. I believe that they are more in tune with the Creator of the universe than we are and that they are more prepared for praising their Creator forever in the life to come.